Why loose green tea is booming. How to enjoy the convenience of tea bags without its disadvantages. In 1907, American tea merchant Thomas Sullivan began distributing samples of his tea in small silk bags. Consumers noticed that they could simply leave the tea in the bag, and better still re-use it with fresh tea. In 1953, after World War II, Tetley launched the tea bag to the UK and it was an immediate success. Today, tea leaves are packed into paper. They are convenient and easy to brew. The population studies showing the many health benefits of green tea are conducted in Asia, where people drink loose tea. There is no evidence that drinking green tea bags can give you sufficient long term health benefits. What's the problems with drinking green tea bags? Here are seven reason why loose tea is preferable. To add insults to injuries, these tea particles are bagged into papers, which can be tasted. They are also more likely to suffer from long shelf life. According to a 1996 American study conducted by Hicks, "extraction of caffeine was higher from the tea bags than the loose leaves". This is because tea bags contain green tea that has been broken into pieces. The greater surface to volume ratio causes caffeine to diffuse out quickly. This higher caffeine extraction, together with nutrients loss, causes tea bags to taste bitter. In contrast, if you want a cup of tea that is calming and relaxing, then you will have to go loose-leaf, as it has more theanine content. Not quite sure what theanine does? Read on. I will explain later. Most tea bags are made from CTC leaves. CTC stands for "crush, tear and curl". It is used primarily to process low quality leaves. Its name is fairly descriptive. The machines compress withered tea leaves, forcing out most of their sap. They then tear the leaves and curl them tightly into balls. The leaves are then fired, or dehydrated. A highly mechanized process, it makes possible the rapid processing of large amount of leaves which would otherwise go to waste. In addition, a chemical known as bleach residue remains in tea bags. Contrast this with gourmet loose tea, which is picked and made by hands with extreme care by tea artists with many years of experience. No wonder tea connoisseurs are only interested in loose-leaf. They have greater aroma, body and aftertaste. They offer stunning varieties as gourmet teas can be processed many different ways to optimize its flavors and aesthetic qualities. Many factors influence the quality of green tea. One of the most important is leaf age. The highest grade green tea is tippy, as they grow at the top of the tea bushes. These are young tea shoots harvested early in the season and consist of just one bud with up to 2 slightly unfurled leaves. They are bud tea, not the leaf tea you normally see. Another important determinant of quality? Harvesting season. Spring grows the best green tea. Summer the worst. Scientific studies have shown that young tea shoots contains the highest level of theanine and EGCG. Theanine promotes calmness and aid concentration. 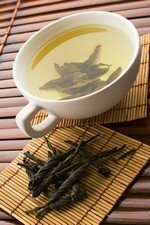 EGCG is the most powerful and abundant antioxidants present in green tea. Needless to say, such high grade is only available in loose-leaf and not tea bags. A quality tea can be infused 3 times, making it very economical to drink. Surprisingly, tea bags can sometimes be expensive due to the bagging and packaging processes. Tea bags are made from Fannings and Dusts. Contrary to what many people believe, they are not factory floor sweepings. Just like there are good and bad loose tea, some tea bags (such as the Taylors of Harrogate's Yorkshire Gold) are much higher quality than others. Companies like Lipton and Tetley make tea bags for consumers who like to have a cheap, bland and consistent brew. This is especially true for black tea. 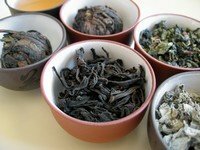 Being fully oxidised, they keep fresh more easily than green tea. The main advantages of tea bags are convenience. They are easy to store, quick to brew and ideal when in the office or "on the move". Now you may wonder: is it possible to combine the full flavors of loose tea with the convenience of tea bags? Yes. The answer is tea filter bags. You can buy them online or in the supermarket for 5 cents apiece. Simply place your whole leaf tea in the disposable bag and add hot water. A bag can be used and re-used again in the office for the entire day. These bags are usually large enough for loose leaves to expand.